Please note you will need a Pre-Paid Parking Permit to park at MetLife stadium. Parking lots open five hours prior to kickoff. It is highly recommended to arrive early as the closer it gets to kickoff, the more crowded the roadways and parking lots will become. So arrive early to tailgate or check out the plaza area between the stadium and entry gates. When do the parking lots close on gamedays at MetLife Stadium? Parking lots close two hours after the end of the game. 1.) Tailgating has become a ritual at the stadium and is permitted provided guests tailgate in the same space occupied by their vehicle. Please be courteous to your fellow fans -- open parking spaces should not be used for tailgating. MetLife Stadium and the Jets are actively monitoring all lots with additional security and there are patrols to enforce the one car, one spot policy. 2.) While tailgating is permitted in designated locations at specified times, any unauthorized commercial activity is strictly prohibited and is a violation of the law. Individuals and companies are prohibited from selling access to a tailgate party to members of the general public either in advance of or on the day of an event. 3.) Ticket holders may not reserve adjacent parking spaces for others. 4.) Tailgating is not permitted in the parking garages which are located on the Arena side. And also not permitted in the non-tailgating areas located in Lot G.
If you have a large tailgate party, stadium management strongly encourages you to arrive early and use the grass berms and paved areas on the islands located between the parking lots. This will allow you to fully enjoy your party while being courteous to your fellow fans. Please do not discard hot coals near vehicles or in plastic waste receptacles; there have been several car and trash fires over the past few years. For your safety and convenience, hot coal bins have been provided for the disposal of charcoal. These large, orange “hot charcoal” bins are located on the islands/plazas between the parking lots. PLEASE DO NOT DISCARD TRASH IN THE HOT COAL BINS OR HOT COAL ASHES IN THE TRASH CONTAINERS. Outside catering companies are not permitted on the Sports Complex. Delaware North Sportservice is the official food service provider/caterer for the MetLife Sports Complex. To schedule a catered event, please contact Delaware North Sportservice at (201) 559-1631. If it is more convenient, green permit holders may park in any lot, and yellow permit holders may park in yellow or orange lots. Parking lot toll plazas open five hours prior to kickoff. In order to protect the environment and save gas, we encourage fans to carpool or take mass transit whenever possible. Please be considerate of your fellow ticket holders and adhere to the one car, one space policy. How much do the pre-paid parking permits cost? Please contact your Client Relations Representative for parking prices for limousines, RVs, box trucks, trailers, buses and other oversized vehicles. When will I receive my pre-paid parking permits? If you are a Season Ticket Holder, you will receive parking permits for each home game, depending on the number of season ticket associated with your account, in your Season Ticket mailing. Please bring the appropriate parking permit to each home game to ensure access to the MetLife Sports Complex parking lots. If you do not have your parking permit you will not be permitted to park in the MetLife Sports Complex parking lots. Where can I park with my pre-paid parking permits? Based on your seat location, your Pre-Paid Parking Permit will allow you to park in one of the three color-coded parking areas. The green colored lots are for Club and Suite season ticket holders, yellow for all PSL season ticket holders and orange for all 300-level season ticket holders. As in past years, you will need a Pre-Paid Parking Permit to park onsite (both on the stadium and arena side). Can I use My Jets Account to transfer game tickets and pre-paid parking permits? Yes. You may log into My Jets Account and post your pre-season, regular season, and pre-paid parking permits for resale. You may also transfer your pre-season, regular season, and pre-paid parking permits to family, friends or business associates. Log into your account at newyorkjets.com/myjetsaccount and follow the step-by-step instructions. Can I purchase parking passes for an individual game? 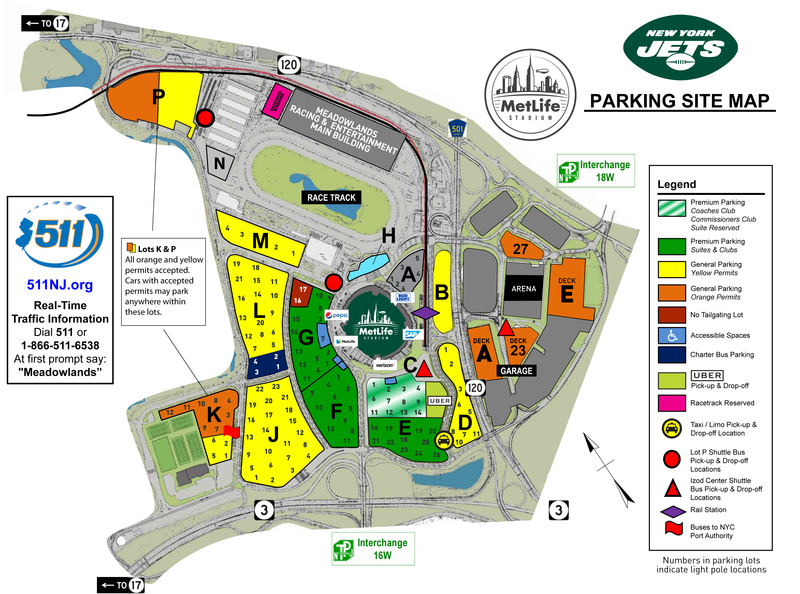 For New York Jets games guests may purchase a pre-paid permit via Ticketmaster by searching for "Jets Parking." The permits sold here are for any Yellow Lot (B, D, J, K, L, M and P) for $40 or any Green Lot (E, F and G) for $50. New York Jets guests may also use the NFL Ticket Exchange. Guests will want to click on '"Show Parking Tickets" after reaching the page for the game they are attending. Passes are labeled "ORGA," "YELL," or "GREEN." The numbers on the permits do not mean anything and do not guarantee a specific spot in a specific lot. Is there satellite parking available? Yes, two popular independently run parking alternatives are Secaucus Park & Ride and Murray Hill Parkway. Secaucus Park and Ride is located at 675 New County Rd. at Seaview Drive in Secaucus and costs $20 on Sunday, $28 on weeknights and $165 for 8 game passes — park your car, then hop on the NJ Transit train. How can I gain access to ADA parking? Ticket holders who have a valid ADA license plate or a valid hang tag AND a Pre-Paid Parking Permit will be directed to park in the ADA parking spaces in parking lots E, F or G. The individual who was issued the valid ADA license plate or ADA hang tag must be in the vehicle and have a valid ID. This will be verified by the traffic and parking staff. Please call 800-469-JETS (5387) with any feedback or questions you may have about your parking experience.